This mod replaces the default Pip-Boy 3000 texture with a high-resolution version that retains the feel of the original. I'm happy to let others use assets from this texture to create alternative versions (such as rusty), however, I would like you to ask permission before it is uploaded or at the very least include a link to this mod with credit to me. 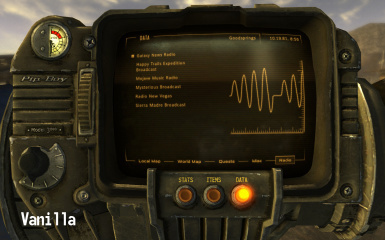 This mod replaces the default Pip-Boy 3000 texture with a lore friendly, high resolution version. Click the above image for a high-res comparison. You can barely see the difference, right? That's the point! My goal was to create a retexture that is as true to the original Pip-Boy 3000 as possible while still offering updated and higher quality features. I've highlighted the major differences in the comparison above, but even areas outside of the highlights have seen improvements from the vanilla. I've updated all text, the Rad-O-Meter, and the screws and I've added an HD metal overlay to everything else for extra depth and detail. This mod is not compatible with mods that change model of the PipBoy 3000. Install this file after any other mods that change the PipBoy 3000 texture. If this mod looks familiar, that's because it is a direct port from my popular Fallout: New Vegas mod of the same name. You can download it here.